And the beauty of these dishes is that clean-up will be a breeze as well. Pizza for breakfast? Yes, please! This tex-mex inspired breakfast pizza – chockfull of eggy-avo-cheesy ‘tater goodness – will help kick start your day and fuel your adventures! Comfort in a bowl. A hearty soup like this one is a great way to warm up after a rollick in the woods! Bonus: a big vat of soup is a great way to feed a crowd! ps – You can get a head start on this recipe by pre-chopping your veggies at home before you hit the road. 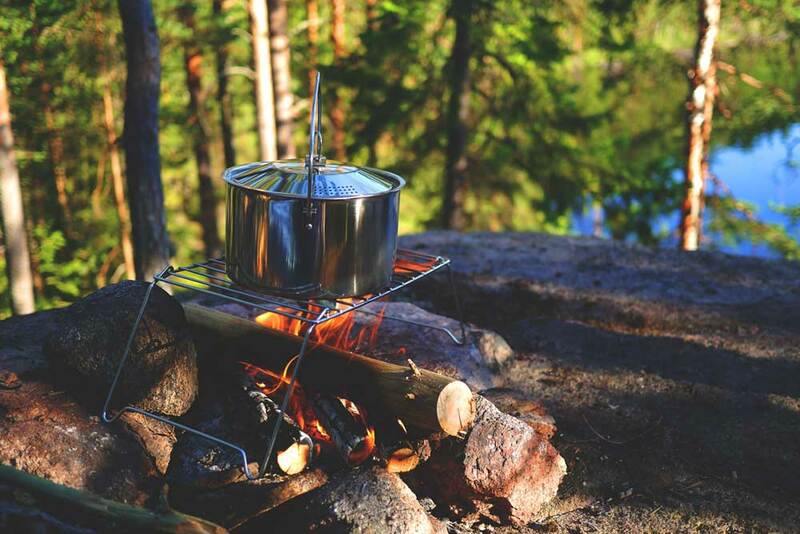 Calling all camping foodies! This one-wok campsite jambalaya is bound to be a crowd-pleaser. Don’t forget to pack some chicken thighs, shrimp and (andouille) sausage in your RV fridge or cooler. Pack some heat in this dutch oven campfire chilli! With hearty beans and meaty goodness, we think this slowcooked chili is well worth the wait. Bonus: It’s a fantastic dish to add to your RV tailgating menu for that next football game, too! Sometimes you can have your cake and eat it, too! ;) What’s better than campfire s’mores? How about s’mores and cake combined into one oooey-gooey, mouthwatering concoction? Yes, please. While we’ve got dutch ovens on the brain, keep this apple cobbler in mind… Tender, slow-cooked apples with the perfect hit of cinnamon spice and toasted topping make for a pretty wonderful way to end your camping feast. Hungry for more? Check out more recipes on the Go RVing Canada blog or visit Go RVing Canada on Pinterest.